The other day I saw a lovely pink rag quilt featured on Craft Gossip. 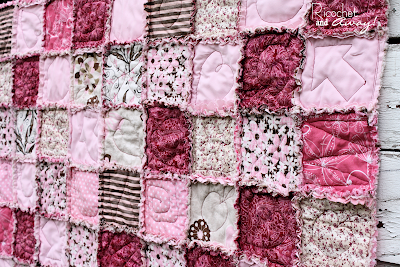 Rikka from ricochet and away made the cute quilt for her daughter and it is the first time I have seen a rag quilt. So here is my piles of fabric all cut out, and piles of batting and I am getting ready to start sewing them together this evening (but have to clear it all away to have dinner in a bit). I will show it all finished over the weekend! This entry was posted in Plans on October 21, 2011 by Handmade Cuddles. Can’t wait to see your quilt! I’ve been tempted to try to make one, but haven’t yet. The one shown looks so cute! Your fabrics look really pretty. I’m sure your quilt is going to be gorgeous!